Today's theme is "Parent - Player Guidelines"
I wasn't looking forward to writing an article on how parents should be good parents for their athlete child, as it seems rather presumptuous since usually parents know their own child better than anyone else. And the kind of parent that needs advice probably will not read this article. On the other hand, I have seen and heard a lot of stupid things done by parents over the years, and have made some of those same mistakes myself when my child played years ago... so here goes. Be a parent, not a coach. Your child wants your support and love, not your basketball tips, even though you think you are just trying to help him/her. Your child wants you to be proud of him/her, no matter what happens, however bad he/she played, or however bad they lost. Resist the urge to offer advice in the car on the way home... they don't want to hear it or talk about it then. 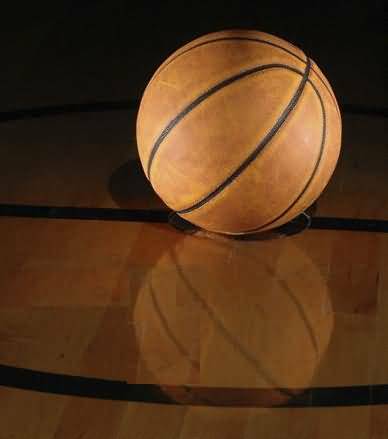 Remember that in basketball there is no such thing as a perfect game. Players, coaches, officials all make mistakes. Michael Jordan never played a perfect game... he always missed some shots or made some other mistake. So don't expect your own child to be perfect. Do not be critical... be supportive. Let them have fun. That's the reason your child should be playing. Don't force your child to play if he/she really has no interest. If your son/daughter shows a real interest in the game, then support him/her without pushing or pressuring him/her to excel. If you want to help, just buy him/her a basketball that he can use anytime he wants to practice dribbling, ball-handling, shooting, etc. If you want to go the next step, put up a hoop in your driveway... and then go outside and play some fun, stress-free driveway games with him/her. Do not try to re-live your childhood through your son or daughter. 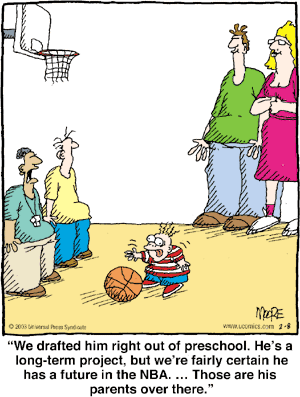 Some parents, who were not successful basketball players themselves when younger, so badly want their child to be a star. Some parents who were great players want the same for their kids. Some parents want to keep the "Smith" name alive (just an example, no real intent to defame anyone named "Smith")... all "Smiths" were good players in this town for many years and we have to keep on with the tradition. No... if your child is not interested, don't force him/her. We all have talents and are special in our own ways. Kids need to discover what they like and what they are really good at... maybe it's swimming, or cross-country, or playing the cello or piano, or painting beautiful pictures. If God wanted us all to be basketball players, we'd all be 7' tall and be able to jump out of the gym! So don't pressure your child. I have seen a parent make a child workout in the driveway for two hours after every "poorly played" game. I once knew a parent who gave his daughter one dollar for every point she would make in a game! - talk about pressure and what that does to the concept of "team". Be supportive, not a contrarian. Support your child. Go to his/her games as much as possible. Support the team. Support the other players. Support the coaches. Criticizing other players so as to make your own child look better is always a bad thing. Undermining the coaches, trying to make yourself look like a basketball authority, will only hurt your child... if it gets back to the coach, your child will probably play less, and if you voice your opinions to your child, he/she will lose respect for the coach and his way of playing the game, and will most likely not play as hard in either practices or games. Remember that there are many ways to play the game, many styles... the one you like is not necessarily any better. Don't be a "know-it-all". Don't offer excuses for your child's lack of playing time. And don't let yourself feel that your son/daughter is "inferior" to the better players... she is special in her own way, and just what this might be may not yet be clear to either you or your child. How often I have heard in a TV interview some very successful, famous person reflect back on his childhood, explaining what a "geek" or poor athlete he was back then. His real talent only became apparent later. Show good sportsmanship... be a good example to your child. It's amazing, but I have seen some parents over the years, people who I have great respect for, good parents, good people, community leaders away from the court... these same people be complete idiots in a gym when their own child was playing. Very good parents can totally lose their objectivity in a gym when they care mainly about what's happening with their own child... how much playing time, official's calls, etc. You can yell at games, but just be positive and encouraging. Don't get on your child, or other players, or the coach. Be respectful of the officials... I have once witnessed an official who really did try to influence the outcome of a game, but 99% are honest and are just trying their best to call a good, fair game. As a parent, you are not objective. I was going to say "be objective", but you can't be because of the fact that you are a parent. Most parents honestly believe their own son/daughter is better than they are... it's rarely the other way around. They see all those uncontested shots they make, with no pressure, in the driveway and flashes of game highlights in the past, but they don't know what is happening in practice. A parent's main concern is first for their son or daughter, as it should be, and secondly for the team. A coach's main concern is what's best for the team in general, and then what's best for the individual players. Encourage your child to follow the team rules and respect other players, the coaches, opponents and the officials. Let your child work out problems with the coach and other players. Listen to him/her intently and offer some advice on how to handle a problem, but first let him/her try to work it out. This is an important skill to learn for later years... and your child will never learn it if you always jump in and try to resolve things yourself. Have confidence in your child to work it out. Be nice! Get along with other parents and fans. Be helpful. Volunteer to provide treats, take a turn working the concession stand or selling tickets, driving to away games, helping with the scorebook, clock or stats, etc. Remember that your child should be playing primarily to have fun, to be with friends, and to be part of a team experience. Forget the college scholarship idea... only a very small percentage of youth players ever go on to play college ball, and that is often not an easy, pleasant road itself. I have had college players come back and tell me years later that the most "fun" they ever had playing basketball was, not as a college player, but as a kid or high school player, with their childhood friends, just for the love and fun of the game. If you want your child to get a college scholarship, have them study hard and get good grades, as they might have a far better chance for an academic scholarship than an athletic scholarship. Coach's Clipboard Premium Membership - join today! Really one of the best bargains available today for coaches and players... a basketball encyclopedia. Immediate online access, comprehensive playbook with offenses, defenses, plays, drills, coaching and player tips, animated diagrams, video clips, mobile-ready, pdfs for print-outs, and more! Recently re-designed with a "new look"... login and take a look if you haven't been there lately!